I happen to like books for kids that are a wee bit spooky and shocking. Those of the old school mindset where children aren't these precious PC angels who shouldn't be exposed to any sort of picture book unless it is filled with fairies and Disney Princesses and sanitary stuff. I love this one in particular because it is about a tiger that eats people. (I mean, what girl of the 70s wasn't scarred for life in the best possible way by the "Ladies First" story in Free To Be You and Me?) It helps too that this story carries a righteous rhyme... one that is so lyrical and fun, it's hard to keep yourself from humming it under your breathe after the first reading. for I'm so terribly, terribly mean. tiger that has ever been." So, yea, there's this tiger see, and he marauds the countryside eating up everyone in his path... that is until he meets a tailor with a pair of scissors and a knack for keeping his wits about him. 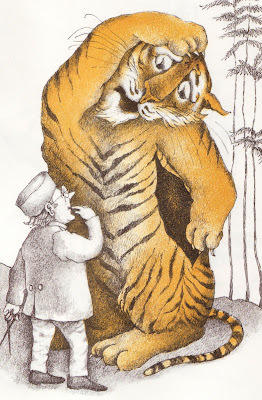 With Jack's poetry as the guide, the creator of Frog and Toad did a great job of bringing the story to life; drawing a tiger that is menacing but laughable. Such a good one! Love this book! I used to read it to my 'infant' class (5,6 year olds)it seems to have sunk without trace somewhere. Would love to get a copy to scare my grandkids. Yes - - - I used to use this one in class too, and yes, where is it now?? Books shouldn't disappear like that! I LOVE this book. The illustrations are wonderful and the rhyme is such fun to roll around your tongue! I took it into my daughter's class and read it to them. It's quite long but they managed it. I was lucky enough to Mooch it from an older gentleman who recommended it when I found something on his bookmooch list and wanted to take more while he was posting. He recommended it and I'm so glad. I love the idea of your blog, too. I'm constantly buying books we don't need that are generally very old and then leaving them lying around the house for my daughter to find. She loves reading old books, too, when I think the majority of kids her age pooh pooh 'smelly' books.